Children are notoriously good at sharing one thing: germs. Illness abounds in schools and colleges, a theme parents and teachers accept as the normal course of life, but it need not be so. Sickness in educational institutions can be mitigated by regular, thorough cleaning. Germs that cause sickness may be airborne and/or spread through contact with surfaces. Germs carried in coughs and sneezes that land on surfaces can stay alive for up to 48 hours. Anyone touching the surface picks up the germs which then enter the body via hand to mouth, nose or eyes. Communal settings, such as educational institutions are petri dishes for the common cold and flu viruses, with parents being urged to send their children to school in spite of coughs and colds. 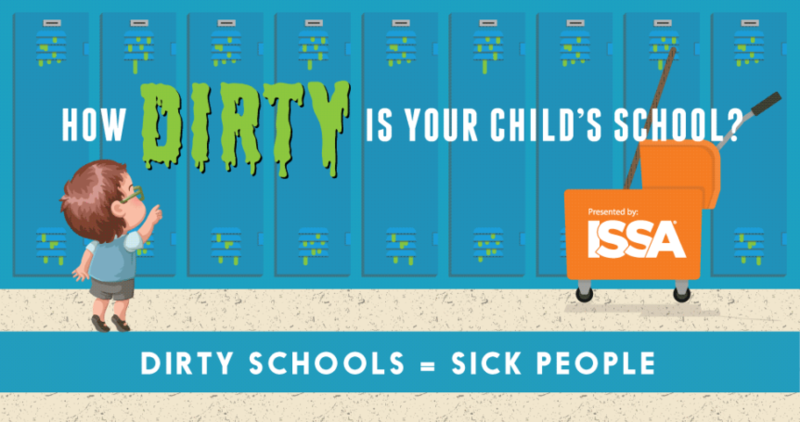 Schools in particular carry a plethora of bacteria and viruses because children work so closely together and frequently touch their own – and each other’s – face without thinking about using the hand sanitizer first. According to the Centres for Disease Control (CDC) proper cleaning is paramount to prevent and reduce cross-contamination of germs. ISSA, the International Sanitary Supply Association, is the worldwide cleaning association that creates quantitative standards to help schools and colleges measure the effectiveness of their cleaning processes so that human health can improve. ISSA certification/standards are considered the gold grade in cleanliness. Their standards for education institutions emphasise “high-performance cleaning” and recommend procedures to inspect and monitor cleaning to ensure its effectiveness and improve results. Education establishments striving for excellence and wishing to keep staff and students healthy rely on credible cleaning companies to manage and monitor cleanliness. Cleaning is one of the first defences against sickness and disease. Educational institutions can be havens for viruses and bacteria that cause colds, flu and sickness. A tidy classroom is not necessarily a clean classroom. Healthy schools and colleges mean a better bottom line for business. A whopping one quarter of total sick days is attributed to coughs and colds. Professional cleaning promotes community health, wellness and safety.